Last year, Ohio-based Everstream emerged as a consolidation platform for fiber in the Midwest, making two acquisitions and spreading its wings across Michigan and beyond. The company’s network now spans 9,500 route miles, hooking up 1,700 buildings including 29 data centers and 250 towers. They have more investment in mind, of both the organic and inorganic varieties. 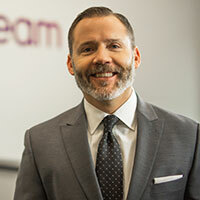 With us today to talk about Everstream’s past, present, and future is the company’s President and CEO Brett Lindsey. TR: How did Everstream get started, and how did you get involved? BL: Once upon a time, there was a 501(c)(3) called OneCommunity, which was started in 2003 in Cleveland with the mantra to drive economic development through investing in fiber assets. They were successful in getting some fiber donated to them from two different companies, one of which I was with at the time. Fast forward to 2010, and they received a BTOP stimulus grant, and I joined OneCommunity to help architect and build out the network through 2013. At that point, we were starting to see opportunities on the enterprise side of things, and so we launched the brand Everstream as a for-profit subsidiary of OneCommunity. We put out our brand, increased the sales force, and started successfully winning enterprise business across Northeast Ohio. Pretty quickly after doing that, OneCommunity realized that the amount of capital required to be in the space far exceeded the opportunity to do so as a nonprofit, so we agreed that we would bring in an investment banker. We raised $50M at the end of October 2015, and moved all of the fiber assets from the nonprofit into Everstream and made that the brand going forward. TR: Over the last year your footprint has grown dramatically via acquisition. Can you tell us about the rationale for those deals? BL: The idea was to be opportunistic. The first transaction we did post-funding was for the Great Lakes Comnet/Comlink (GLC) assets that were heading into bankruptcy. That was a unique asset covering most of the state of Michigan as well as including some longhaul routes to other areas. We became the stalking horse during the bankruptcy process and then the eventual winner. When the deal closed in June of 2016, it took us from 2,500 route miles to 9,500 route miles of fiber network. We made an offer on Lynx later in 2016, and that purchase closed at the end of January. It didn't add many additional miles because both GLC and Lynx were participants in the BTOP grant program run by MERIT. Instead it gave us greater density on a lot of the same routes, took a competitor out of the marketplace, and created synergies from an EBITDA perspective. TR: How has the integration gone for each of the acquisitions? BL: The GLC transaction itself was a bit more complicated because they were in bankruptcy, but the integration was completed shortly after it closed. We had been working with them already for some time. For Lynx, it's been very straightforward, as they were a smaller business than GLC. We picked up some new customer relationships, and most of the synergies are coming from the overlap in colocation and hub sites. We're going through and cleaning that up now, and it will be a pretty quick process. There were also some lit services Lynx was buying for connectivity into Detroit, Chicago, and a couple other places that we can now bring on-net. From an operational perspective, we began billing Lynx customers on our platform as of April. TR: How much of your current infrastructure base is owned versus leased, and how do you view that balance? BL: The bulk of it is owned fiber. Our belief is that the guy with the most fiber wins. We want to have as dense a fiber route as we can, and our goal is to be building 90% of it. We want every customer that we sell to connected directly to the network rather than via type 2 facilities. We do have some leased capacity, but predominantly in the longhaul routes around Wisconsin, Illinois, and Indiana. In Ohio and Michigan where we have the most ubiquitous footprint, our desire is to be building a significant amount of last mile construction. Last year, we added more than 700 on-net buildings to the network, and we anticipate we will do the same in 2017. That wasn't always the case for GLC and Lynx because it is very difficult to continue to build at that clip if you are cash constrained. They did a lot of type 2 connections, but we have shifted that model and we are actively building fiber off both the GLC and Lynx assets. TR: What enterprise verticals are you finding the most success with? BL: It is mid- to large-range customers, and our sweet spot is 100Mbps-1Gbps. Folks that have 6 or more locations fit really well for a regional fiber network. We have done very well in healthcare historically. We own that space in Northeast Ohio and we are receiving some benefits from that now in Michigan. We are doing very well in the enterprise space generally. We think there is a void in areas where our predominant competition is AT&T and whoever the cable MSO happens to be. Because of our intense focus in these specific areas we are doing very well by selling enterprise customers on the value of having a local team. We've done a number of Fortune 500 sales in the last 12 months doing large scale private DWDM networks connecting corporate headquarters with their own data centers and with third party data centers. I think that will continue, as those folks are looking for a different kind of customer relationship, especially when it relates to their main locations. TR: Is wireless backhaul a driver for you as well? BL: We did our first fiber-to-the-tower build in 2014. We've organically grown those existing relationships a little bit, but when you have some of the larger carriers coming off a 10-year contract, we've had to wait for those terms to expire. We think this is the year we will see exponential growth in the fiber-to-the-tower space. We have been selling to the Top 4 carriers in Ohio and Michigan, and we are seeing a significant uptick in the amount of opportunity as older contracts are expiring. I would suggest that Ohio and Michigan are about a year behind some of the other areas, and we are presently bidding on hundreds of individual fiber-to-the-tower opportunities. Small cell is coming also. I don't know if it's coming as quickly as everyone thinks it is in all markets, but we are starting to see those opportunities present themselves as well. TR: How do colocation and the cloud fit into your model? BL: Although we did pick up a small data center with the GLC acquisition, we don't want to be a data center operator per se. Our belief is that we are a facilitator for the data center companies. We are up to 29 data centers connected on our assets now, and that helps drive about 30% of our revenue on an organic monthly basis. Customers are moving more and more information not just to AWS, Azure, and Google but they are almost all doing a solution that requires a local partner for their production facilities, which we provide. We are also doing direct peering for those folks to AWS, Azure, or Google to provide a holistic approach. TR: Do you envision moving further up the stack toward managed services? BL: We want to do predominantly layer 2 and layer 3. We want to be the fiber provider and partner with other folks. Our belief is that there is only so much capital out there to execute on our plan, and we want our money spent on fiber construction and bringing more buildings, towers, hospitals, and data centers on-net. I don't see us trying to become a cloud services provider or moving into the data center space in a big way. There's plenty to do in the fiber space. TR: Do you foresee any network expansion opportunities outside of your current footprint? BL: We would look anywhere that is contiguous from a geographic perspective. I think there could be opportunity for us in Pennsylvania, Indiana, Illinois and pockets of interest in Wisconsin. We are probably not going to go after Chicago, as that is too competitive a market and I don't think it makes sense for us. We do better in Tier 2 and the lower end of the Tier 1 markets where there is less competition -- more opportunity to invest and not be the fifth or sixth guy with those routes. That's worked well for us so far. TR: What do you think of the current M&A environment? BL: We would love to do more acquisitions if they present themselves. I think the challenge is that right now you have a number of different groups that are viewed as platforms for consolidation, but there can only be so many platforms. When you consider the regional providers like us or FirstLight, or some that are getting ready to be platforms like Lumos or CS&L, I think it will be an interesting year. I think we will see more of the same. It will be a very hot M&A market. TR: What types of assets do you think will be in greatest demand when comes to M&A? BL: In our specific space, fiber interests people the most because 5G and all of the other things coming down the pipe will require it. The challenge, I believe, is trying to find people with dense fiber networks to sell is becoming harder and harder. That's followed by quality data center assets, and I think that space is ripe for consolidation as well. TR: How do you differentiate your services from those of much larger national and supranational network operators? BL: One thing that has been interesting with M&A happening over the last year is that it doesn't seem like there's been much focus on the customer and what the customer wants. There's a constant feeling that everyone needs bigger and bigger scale, and I think to an extent that is true of course. But it feels like the customer is getting lost in the mix. I think some of the regional fiber providers, like us, are doing very well and punching above our weight a bit as it relates to the enterprise. If you look at AT&T and the cable company, or even Zayo or Lightower, there is a centralization of resources. Because we are investing so heavily in the local markets, we are being rewarded for that. It will be interesting to see whether companies like us will be able to continue doing that versus everything getting thinned out at the local level. If you've bought dozens of companies you have to do that, but there's a swath of customers that are looking for something else. TR: What does your local competitive environment look like today? BL: AT&T is the LEC in our space, and they will continue to be someone we try to take business away from. On the cable side, since Time Warner Cable was acquired by Charter, what we are seeing a bit of a barrage of advertisements that feed the race-to-the-bottom on pricing. When that keeps getting blasted over the airwaves, people wonder whether they are paying too much. We have to be able to differentiate quality of service and SLAs that we provide. The education process is ever-present because of the advertising. Our sales team routinely spends time educating customers on the differences between some of those network designs versus fiber built directly to them.